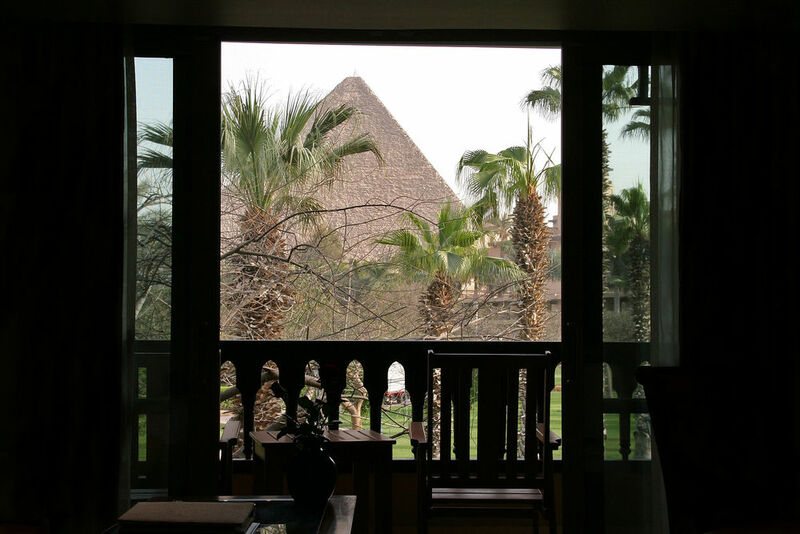 Mena House Hotel has flourished and grown while harboring a rich history. 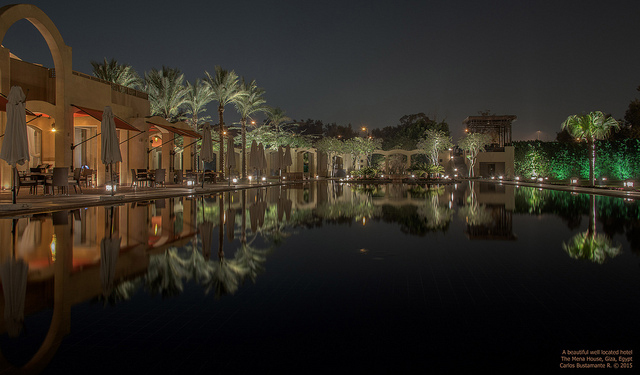 Just 700 meters from the Great Pyramids, the Mena House still manages to stand out. Its elegant and elaborate architecture and decor reflect its abundant and multi-layered history, all while meeting the needs of its guests. In the 1860s, Isma'il Pasha, the Khedive or viceroy of Egypt, built two hunting lodges for himself and his many guests to use when they went hunting. Both were in the desert, less than half a mile from the pyramids of Giza. These hunting trips--though just over eleven miles from Cairo--required lengthy donkey travel, a boat to cross the Nile, and extensive detours around flooded areas. In 1869, when the Suez Canal opened, the Khedive expanded the lodge and built a road from Cairo to the Pyramids. When his Ottoman overlord deposed him in 1879 due to British and French pressure, one of the lodges was purchased by Frederick Head and his wife, who used it as a private home from 1883 and 1885. 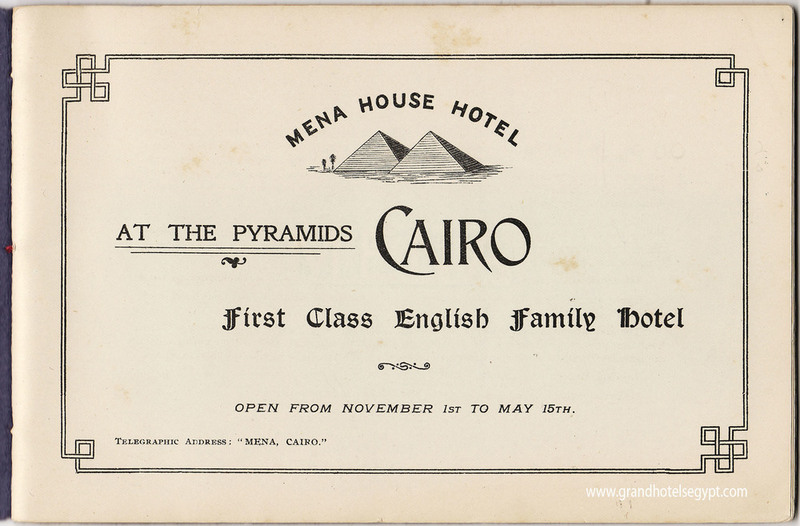 They added a second floor and renamed it Mena House, after the early Pharaoh Menes/Mena. When Head died, the lodge was sold to another wealthy English family, the Locke-Kings. They kept it as their private residence, but built a hotel next to it. As Humphreys observed, their locally-based English architect, Henri Favarger, created a façade whose irregular height and surfaces produced the effect of multiple buildings on a medieval North African street. 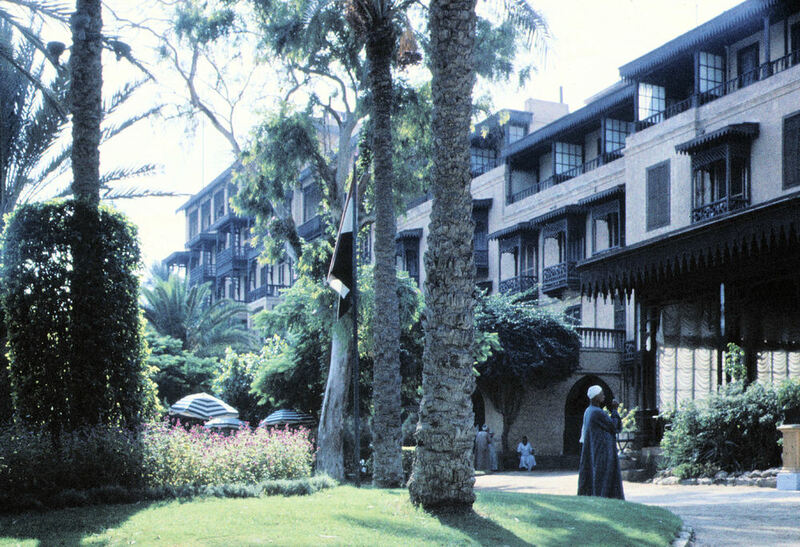 The Mena House Hotel opened officially in 1886 with 80 rooms, and was already finely decorated with pieces belonging to previous owners. The Locke-Kings expanded the hotel even further, as did later owners. 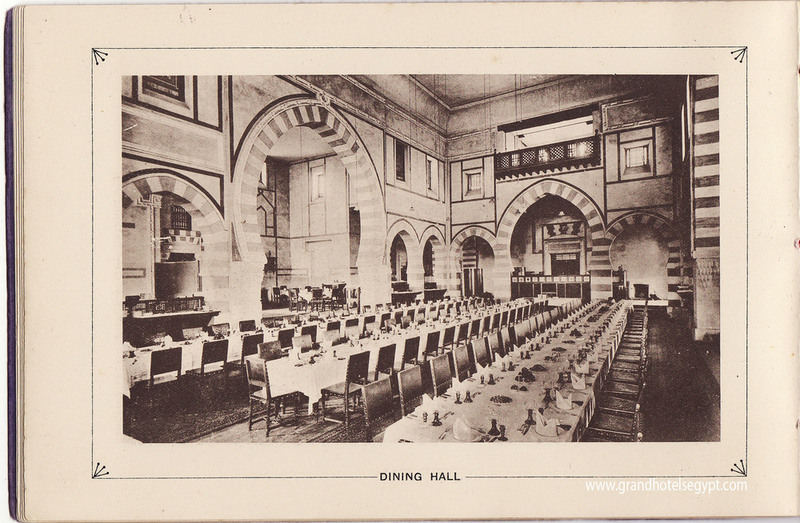 European embellishments were added—Egypt’s first swimming pool, billiard rooms, tennis courts, croquet lawns, race course, and a nine-hole golf course provided entertainment, while a post office and English church were additional conveniences. 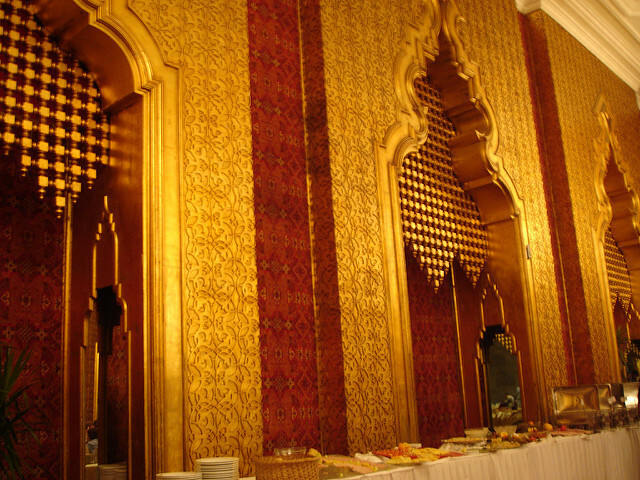 Nonetheless, efforts were made to preserve and continue the original Arab style. 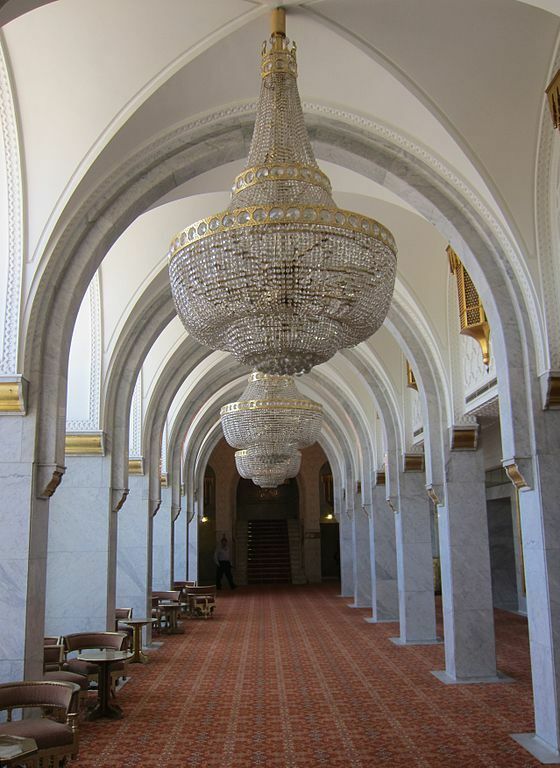 Its eclectic mix of Orientalism and English comfort provided tourists with an overwhelming sense of opulence against a backdrop reminder of four millennia of history. By 1900, despite its isolated location, it became the terminus of the Cairo electric trolley line and had itself secured electricity. Wealthy tourist visitors had pharaoh-like privileges. 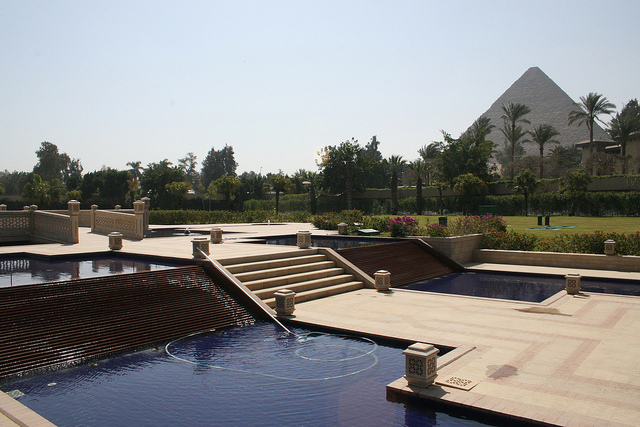 In a desert setting, forty acres of gardens with water features transported them to an artificial oasis. Camels might take them to picnic or observe archaeologists at their labors. 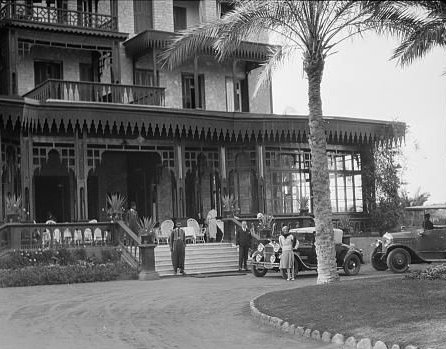 The Locke-Kings returned to Britain, leaving others to manage the hotel until they finally sold it in 1904 to the wealthy Cairo-based hotelier George Nungovich. He added a wing before Egyptian Hotels, Ltd. took over all his properties in 1925. The hotel was nationalized when Nasser came to power in 1952, and the original lodge was torn down to add another wing during that decade. 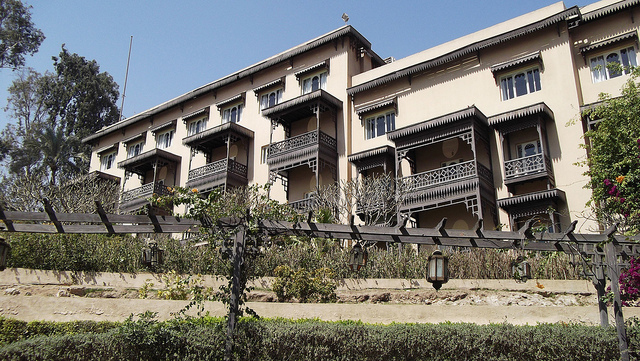 Beginning in 1972, the government had the luxurious Oberoi hotel chain manage the property. Under its purview, further expansion took place, and the hotel grew to over 500 rooms. 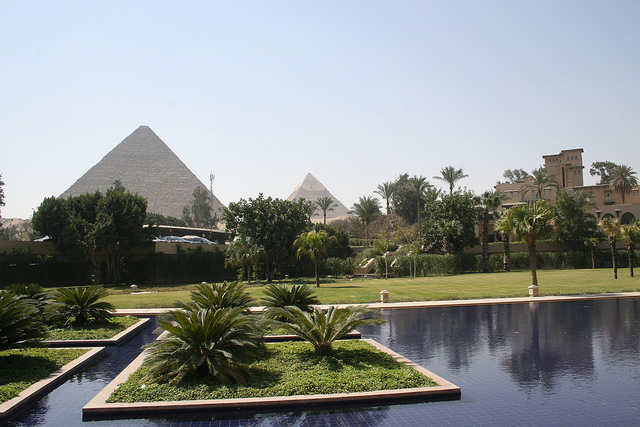 The Egyptian government’s state-owned tourism and hotel agency took back the hotel in 2013, and plans to have the Marriott Group run it, beginning in 2018. 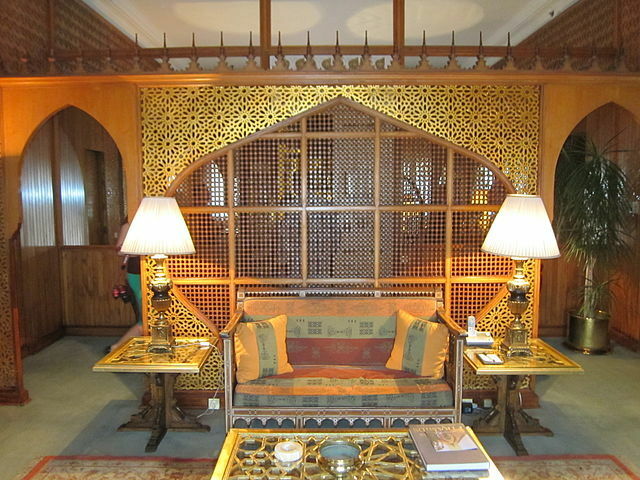 The hotel is still home to antique handcrafted furnishings, original works of art, and golden walls decorated in geometric patterns. Through the years, its guests have included British author Arthur Conan Doyle, American novelist William Faulkner, Napoleon III’s Empress Eugenie, deposed King George of Greece, and film stars such as Charlton Heston and Roger Moore. 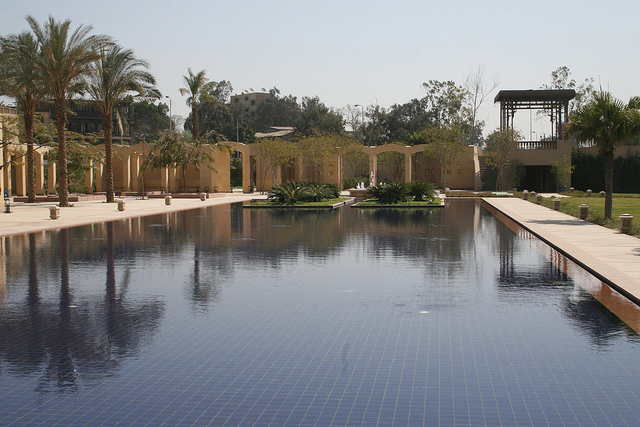 Mena House has also hosted several major strategic meetings. In 1943, it was cleared to house Chiang Kai-Shek, Franklin Delano Roosevelt, and Winston Churchill's Cairo Conference, a discussion about plans for Japan, Manchuria, and Korea’s futures once WWII ended. In 1977, it was the site of the preliminary peace discussions between Egypt and Israel that eventually led to the Camp David Accords. Beyond its history and Orientalist décor, Mena House’s setting is a reminder of tourism’s beginnings in Africa, and how wealth, power, and influence were able to claim a prime location and keep it in splendid isolation for exclusive guests. 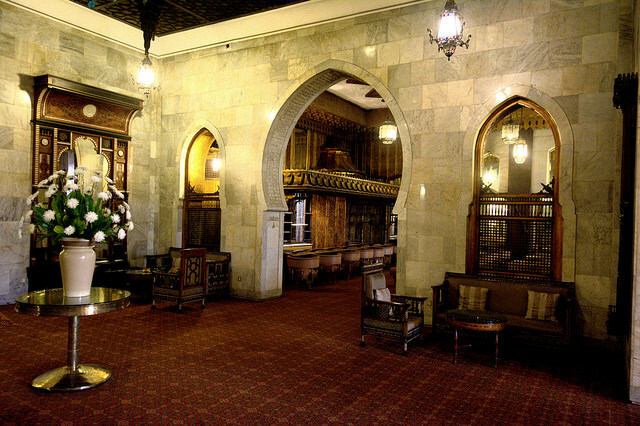 Elizabeth Pipak, Cleveland State University (edited), “Mena House Hotel,” Bright Continent, accessed April 20, 2019, https://access.thebrightcontinent.org/items/show/25. Alothman, Hiba and Ayten Özsavaş Akçay. "A Theoretical Framework for the Evaluation from the Traditional Mashrabiya to Modern Mashrabiya." 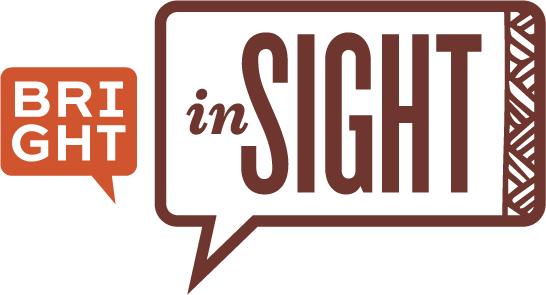 Journal of History, Culture & Art Research 6 (3, 2017): 107-121. 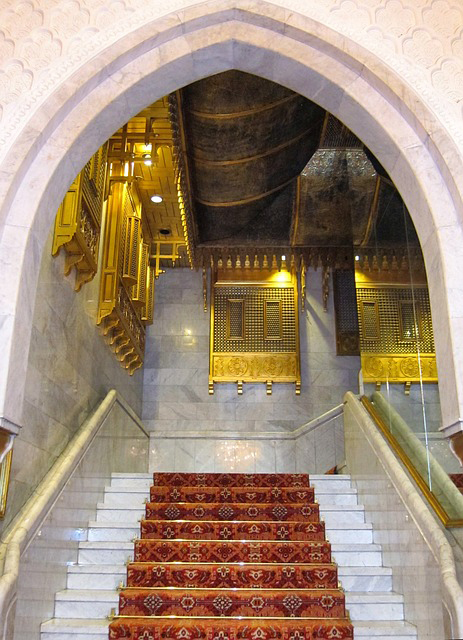 Al-Sayyad, Nezar. Cairo: Histories of a City. Cambridge, MA: The Belknap Press of Harvard University Press, 2013. Humphreys, Andrew. 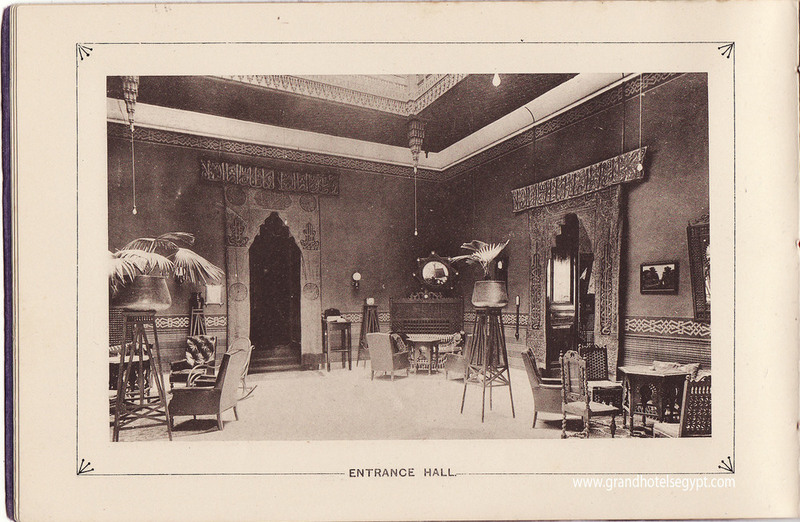 “Mena House.” In Grand Hotels of Egypt in the Golden Age of Travel, pp. 100-117. Cairo: American University in Cairo Press, 2011. Kuppinger, Petra. "Globalization and Exterritoriality in Metropolitan Cairo." Geographical Review 95 (3, 2005): 348-372. Mena. 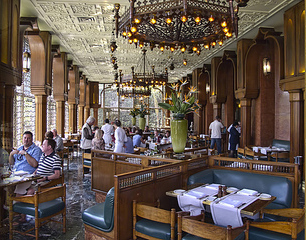 Cairo: Mena House Hotel, n.d.
Raymond, Andre. 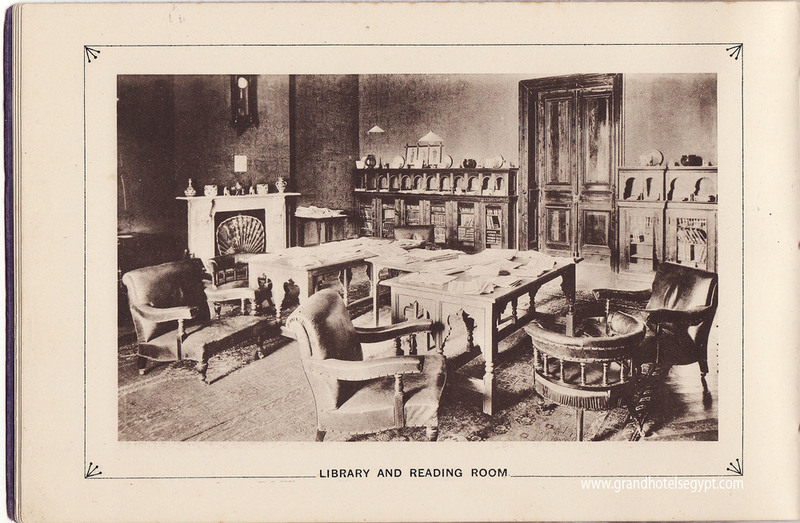 Cairo. Cambridge: Harvard University Press, 2000. Published on Dec 20, 2017. Last updated on Dec 21, 2017.